Properties in Eastern Karaby Church average 4 out of 5 stars. PAX APARTMENTS, Close to Lund Central Station. Property 9: PAX APARTMENTS, Close to Lund Central Station. Charmerende hus med fantastisk udsigt over Ringsj&ouml;n. Her er alt du skal bruge til en hyggelig ferie. It was our first experience of Sweden and we did not know what to expect, but it was all worth it. Our holidays in the cottage was abosolutely great. The owners of the cottage are very hospitable. Everything was available in this sweet cottage, even wifi which made our kids (3) very happy :). 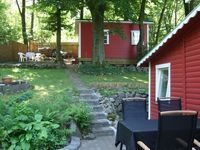 Beautiful setting in the woods, great nature and wild life, just a few steps away. In the evening it is very quiet, no noisy traffic :). The weather was fine...in the evenings we made walks, made a little campfire at the fire place in the garden. A great base for making trips in the south(west) of Sweden, which we did. The opportunity for horse back riding was 20 minutes away from the cottage. It is worth making a trip to the nature reserve of Kullaberg. All together this was a great stay for us. We certainly will come back to Sweden. If you love the things mentioned above, this is the cottage you want. Best regards from the Netherlands. Barry, Jos&eacute;, Famke, Bjarne and Ilse.